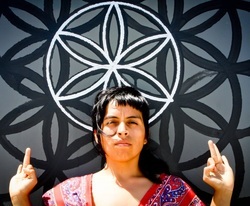 Vera Arias is a local artist, graphic designer and bike mechanic for Demo-Graphics Inc. and H.E.R. (Help Earth Ride). She received her Diploma of Fine Arts from School of the Museum of Fine Arts Boston and earned her Associates Degree in graphic design at The Art Institute in Fort Lauderdale. By using all her skills, she has been working hand in hand with grassroots community projects to improve the areas in our city. She is in the process of setting up community workshops on basic bicycle maintenance with local organizations. Both the bicycles and art become an integrated core of who she is. She recently collaborated on a workshop to empower new riders at the Magic City Bicycle Collective, in which she taught the basic mechanics of fixing your own bicycle. She currently resides in Miami and enjoys riding her bike with friends on weekly bicycle rides. You may contact Ms. Arias at vera@demo-graphicsinc.com.